There are several things you’ll want to include in your bridal contract to book brides. 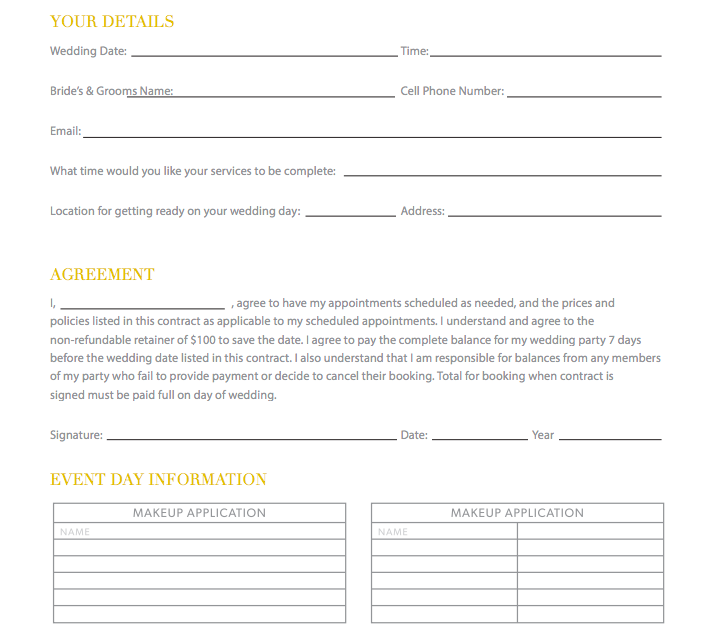 I highly recommend creating one for brides to fill out and send back to you to reserve all bridal bookings. See the example below for an idea of how to structure your contract and what to include/not include. I recommend quoting your brides 1 prince which includes a trial, lashes and touch up containers. This will keep your brides from deciding they’d like to save and not going ahead with a trial or lashes. Both of these are a really good idea. Here’s why. If you don’t do a trial for a bride you run the risk that they may not like their makeup on the day or that you could have done a better job if you had a practice run with their particular skin type. The trial allows you to see which colours you like, get a feel for the dress style, hair style and jewelry they are going to go with and tailor the look for them. This is also where you’ll discover their eye type and face shape. When you’re new, it’s a good idea after the trial, if you’re not completely happy with how the look turned out, to research how to better contour, highlight or emphasize your bride’s specific features. It’s always good to also include a section asking your bride if they are doing first look photos. This way you will ensure makeup is done before those if they are before the ceremony. I like to finish an hour before the wedding party has any event including the ceremony or the first look photos. This gives your clients time to eat, change, get photos with their photographer and get to their next location in good time. Currently, I take the full bridal price upfront to complete a booking. When I first started, I took 50% as a deposit to reserve the date. You will figure out which method works best for you in your business. As your business grows and you have lots of demand for each weekend, I highly recommend moving toward taking the full bridal price upfront. A lot of times brides will say they aren’t 100% sure on the number of ladies wanting makeup on the day. I always respond that they error on the high side and let you know as soon as this number changes. Let them know that they will be responsible for the extra payment if someone last minute decides to not but that if they give you enough notice (For example, 1 month) it’s not a problem. I like to do this so that you will for sure have enough time to do everyone who would want, which will keep your brides happy. Last, I like to make sure that you book off at least 1 hour after you plan to finish your wedding party. This gives you time just in case the makeup runs late or you end up doing some fixing or touch ups. It’s better to have more time for your brides and keep them happy with your service than to be rushing to finish everyone and not be able to fix things that may come up (For example, someone’s eyelash coming loose) before you leave. I do like to include a section similar to this to let your brides know that the deposit may not be returned. If someone decides to move the wedding you can be the judge of whether or not you return the deposit. I recommend being reasonable. If someone’s parent is diagnosed with terminal cancer and they move the wedding up or back because of it, returning the deposit would be the proper thing to do. If someone just decides to move the wedding for another much lesser reason and you’re still able to book them at their new date, just transfer the amount to the booking for the new date. If they decide to go with another artist, you may want to keep the deposit, especially if you have turned down other weddings for that weekend because you had a bride booked. Ultimately, this is your business and your number 1 goal should be to keep your brides and clients happy. The happier they are, the more friends, family and others they will refer and the better they will speak about your business. Setting the boundaries in a bridal contract protects you and your services and sets out the expectations from your clients about what is and is not included in your services.